Tropical Storm Ian continues to show little change in strength as it moves over the central Atlantic, according to the Associated Press. The storm’s maximum sustained winds at midday Tuesday Sept. 13 were near 45 mph (75 kph) with slight strengthening forecast over the next two days. Ian is centered about 895 miles (1,435 kilometers) east-southeast of Bermuda and is moving north-northwest near 13 mph (20 kph). Meanwhile far out over the Pacific, Hurricane Orlene has weakened a little. The Category 2 storm’s maximum sustained winds are near 100 mph (155 kph). 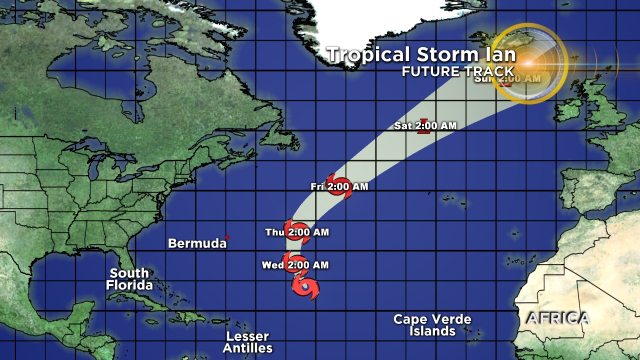 The U.S. National Hurricane Center says gradual weakening is expected during the next few days. Orlene is centered about 605 miles (975 kilometers) west-southwest of the southern tip of Mexico’s Baja California peninsula and is moving north near 5 mph (7 kph).